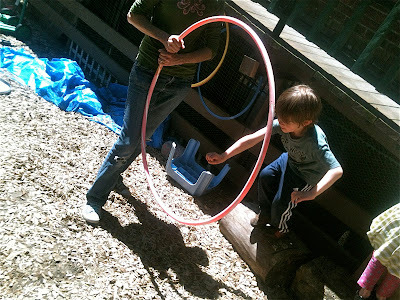 Whenever I write posts like the one from last Thursday, in which I rang an alarm bell about the trend of preschools to turn away from traditional play-based education and towards the flash card-worksheet-direct instruction model favored by the Tiger Mom set, I receive comments and emails pushing back, some blaming teachers, some asserting that a nice dose of stress is a good thing, and a small group of hand-wringers who worry that if we don't start early, those darn kids will never learn the importance of nose-to-the grindstone perseverance. From where I sit, I find the assertion that teachers are somehow pushing for increasingly "academic" preschools both odd and a bit confounding. I suppose that there are some Teach For America types out there, those who were taught churn-and-burn ideology instead of age-appropriate pedagogy, who have found their way into preschools, but I have never met a professional early childhood educator who is doing anything other than fight tooth-and-nail to protect her students from the toxic stress and psychological damage done by this type of preschool curriculum. We're not all play-based, but anyone with any experience in working with young children knows that "focused, goal-directed behavior" is not developmentally appropriate for preschoolers. This anecdotal knowledge, gleaned from my own experience and the experience with every preschool teacher with whom I've ever spoken on the topic, is supported by the overwhelming majority of the research. So where does this push come from? In Thursday's post, I blamed the corporate education reform movement lead by charlatans like US Education Secretary Arne Duncan and Michelle Rhee. And they are, at bottom, to blame, but the ones who are directly pushing for this type of toxic preschool curriculum are freaked-out parents. 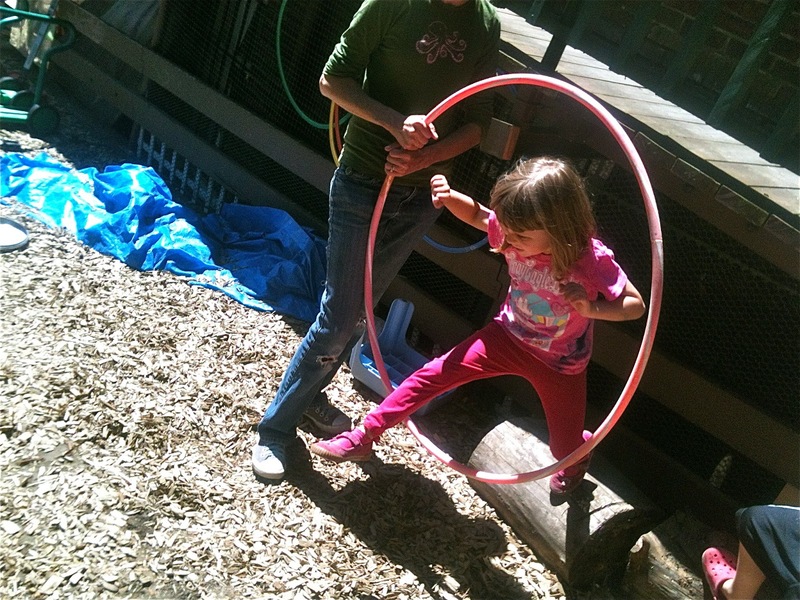 Our play-based school is affiliated, along with some 40 other play-based schools, with North Seattle Community College here in Seattle. Each year we take part in "open registration" a sort of festival of cooperative preschools at which parents can talk to representatives (parent volunteers) from each of the schools to ask questions and, if they so choose, enroll in our classes. Generally speaking, Woodland Park's rosters are usually already full for the coming year (although we set aside some open registration spots in our Pre-3's class and our 5's classes), so we're there largely to compile a waiting list, but we still interact with a large number of parents each year. And even here, even in this progressive city, at this heartbeat of cooperative preschools, parents come to the table to ask about our early reading program, or math curriculum, or our homework load. Not every preschool teacher is in a position to fight back, and they have to give in or perish, hopefully continuing the good work subversively. But some of us are in a position to do something, although I don't know what to do about convincing parents other than to speak out about it, as a teacher, parent, and citizen, and hope I can convince the right people. I don't know if we'll be louder than the corporate education reform PR machine, but if we can get parents to listen, the best interests of children are on our side. One thing I know we can't do is let them drive any more of a wedge than they already have between parents and teachers: we're the ones most closely allied in wanting what's best for our children. We might disagree with exactly what is best, but there is no doubt that flash cards and worksheets are a grimness. Stress is neutral -- it is a person's perception of the event that determines their response . . . Stress is positive when the person feels stimulated and able to manage the situation. This positive response prepares the body to action and activates the higher thinking centers of the brain. A positive response to stress can provide the energy to handle emergencies, meet challenges, and excel . . . Stress is negative when a person feels threatened and not in control of the situation. These feelings instigate a powerful reaction -- affecting both the brain and body in ways that can be destructive to physical and mental health. I can think of nothing that would make a person, a young child, feel more threatened and out of control than to be expected to "handle material for which their brains are not yet equipped." To be drilled on it with flash cards and worksheets, tested, to be found wanting, all delivered in a manner, and on material, that you are not capable of handling, according to an overwhelming majority of the research. We're talking about "toxic stress," to quote the Scientific American article again. There are some have who written me, doubting that preschoolers are really suffering from that much stress that we need to worry about it. I hope that most of them are not, but the ones in these kinds of school are, and there seems to be a push to make more of them. So on that ground, I feel it's urgent. I don't believe there's any research out there specifically on preschool stress, but there is some on educational stress in general, especially among high schoolers, and at least some of that is attributable to the policies advocated by corporate reformers and the resulting parent pressure to "succeed." I can tell you that I've never met a preschool teacher who would claim that a stressful environment is appropriate for her students and I never expect to. But how do young children begin to learn the important lessons about perseverance and hard work? That's where play and positive stress come in. Anyone who has worked with young children at all can tell you that despite the romantic notions, play is not all fun and games. At any given moment in our classroom, there is, of course, a lot of that, but you'll also see brows furrowed in concentration, cheeks wet with the tears of frustration, and faces red with the heat of anger. A proper definition of play doesn't even include the word "fun": it does, however, include the concept of being "freely chosen." When a child, or any person for that matter, sets his own tasks, ones chosen by himself, for himself, ones that address his own questions and curiosities about the things and people in his world, and is then free to pursue those questions through his own methods: that's when deep learning takes place. And that is how the human animal is born to learn. Time and time again, researchers find that only a tiny fraction of information delivered through direct instruction, even among adults, is actually "learned" (in that it's remembered beyond the test) while nearly all of what is learned through the direct experience of play is retained. No, learning to shut up and do the work imposed on us by others is not education that teaches the work ethic. That is how one teaches obedience. Flash cards, worksheets and other kinds of drilling cause negative stress not because they require hard work and perseverance, but because they embody mind-numbing rote, the opposite of a child's natural way to learn, which is through play. Hard work and perseverance are built into play, and study after study has found that when children are allowed to freely explore in an open-ended manner without fear of being labeled a "failure," they work longer and more diligently on their tasks than those simply following instructions. When a child plays, it opens her mind fully, she is a scientist, an explorer, an inventor. This is where creativity and critical thinking come from. There are challenges, risk, and mistakes, all of which cause stress, but without the entirely unnecessary added toxic stress of compulsion, adult expectations, and judgement. You see, whether we like it or not we all spend our lives jumping through hoops. That's the nature of life. That's the nature of education. Toxic stress comes from being compelled to jump through hoops held by a task master, or else: hoops in which we have no personal interest, or for which we are simply not yet ready, or through which we've already been too many times. Positive stress, the kind that makes our heartbeat with excitement and anticipation is a result of choosing our own hoops at our own time and through which we attempt to jump in our own manner. It's the difference between jumping through other people's hoops or our own.